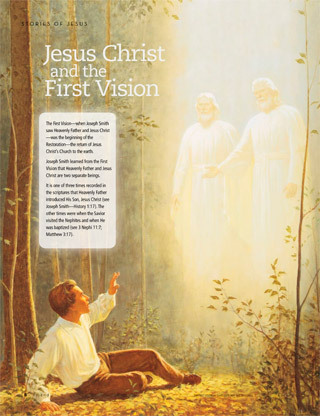 The First Vision﻿—when Joseph Smith saw Heavenly Father and Jesus Christ﻿—was the beginning of the return of Jesus Christ’s Church to the earth. Joseph Smith learned from the First Vision that Heavenly Father and Jesus Christ are two separate beings. It is one of three times recorded in the scriptures that Heavenly Father introduced His Son, Jesus Christ (see Joseph Smith—History 1:17). The other times were when the Savior visited the Nephites and when He was baptized (see 3 Nephi 11:7; Matthew 3:17).